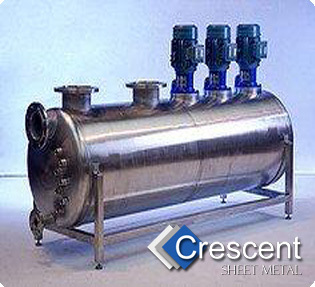 At Crescent Sheet Metal Company we design and build a wide range of steel work and sheet steel items for industrial and commercial customers, including national utility companies and major civil engineering contractors. As a small, flexible and highly experienced metalworking business based in Mossley Greater Manchester we are well placed to undertake one off bespoke construction and fabrication work and also prototype work. Our wide range of individually designed products includes bollards and barriers, Doors, Gates and Railings, Loading Bay construction repair and reconditioning, balustrades, handrails, window grilles, access ladders, spiral and standard staircases, and fire escapes. We combine age-old metal working craftsmanship with bespoke design. Together with our partner company Consolidated Electrical Services of Hazel Grove, who are Electrical Engineering Contractors and specialists in automated door controls and access control systems for business we offer a one stop shop service. All of our products are available on a supply only or a supply and fit basis. The Crescent Sheet Metal company have been based at Woodend No. 2 Mill in Mossley, Greater Manchester for more than 30 years. We use traditional tools and equipments and as a local business we are well placed to deliver traditional high quality unique products at very competitive prices. Working for national industrial and commercial customers we are used to providing a nationwide delivery service for our products.